My baby turned six months old last week. It feels like just yesterday I was telling you about how I was just starting to figure out surviving with 4 kids. I can't believe it! She also started crawling a few weeks ago... and that was quite a surprise. Now she is "into" EVERYTHING at our house and I am constantly looking for ways to keeping her hands busy (and away from anything breakable or dangerous, ha!). Sensory bottles and squish bags are two classic favorite activities that I like to do with my little babies. Today I have my favorite easy sparkly squish bag to show you. This sparkly squish bag is so easy that it only need 4 things. 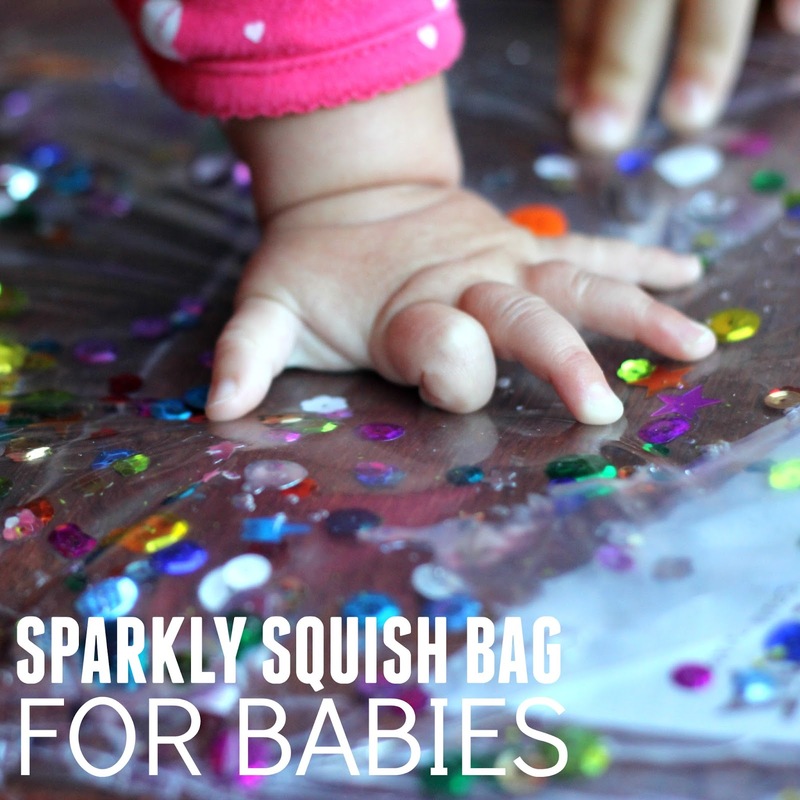 To set up your sparkly squish bag it takes about 2-3 minutes and then you can just hang out nearby and watch as your little one starts exploring. Then add in some sequins. Then try and get as much air out of the bag as possible before sealing it shut. Stick the bag to the floor/table using clear packing tape or another favorite tape (painters tape or duct tape work too). I like to tape around all 4 sides to make it extra secure. Once that is done, bring your baby over and help her touch the bag. Mine was AMAZED at the bubbles and how the water moved. She just stared and pressed the sequins and crawled around on the bag and touched it again. I consider an activity a success if it keeps a baby busy for a few minutes. My 6-month-old played with this bag for over 5 minutes. If her 3-year-old brother hadn't tried to push her aside to join in, it probably would've lasted longer. Once my 3-year-old joined in then I knew it would probably pop- ha! But it actually stayed together for awhile despite less than gentle touches. Since my daughter is also working on sitting up and not falling over, I also stuck the bag on the window and watched as she batted at it and pushed on it a bit while staying in a sitting position. It was pretty cute. She was so enthralled she willed herself to stay up longer. Squish bags that are meant for babies need to be taped really securely. Double bagging the water and sequins and taping the top of the bag shut can prevent breaking... at least for awhile. If your baby is crawling on top of the bag then it might break eventually due to the baby's weight. Keep an eye on your baby to make sure that if the bag does pop (or rip) you remove it (and the sequins) immediately. Baggie painting is another favorite for crawlers and rollers (and bigger toddlers too). If you haven't tried it yet, I highly recommend it. You can also check out our favorite playtime activities for babies HERE if you need more fun ideas to try.